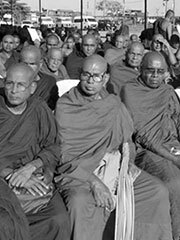 Sri Lankan Buddhism belongs to the Theravada tradition. About 69% of the country adheres to Buddhism. Sri Lanka is the country with longest continuous history of Buddhism. Theravada has been the major religion in the island since soon after its introduction in the 2nd century BC by Venerable Mahinda, the son of the Emperor Ashoka of India during the reign of Sri Lanka’s King Devanampiya.